assessment will demonstrate that the oxygen by-product from hydrogen production can be as valuable in waste processing as hydrogen is in the reduction of fuel pollution. The oldest and still most common practice of solid waste disposal is the landfill. At a safe distance from people, waste is dumped on a parcel of land and spread out in a uniform layer. The layer of waste is covered with a layer of dirt. Alternating layers of waste and dirt are stacked on top of each other until the total reaches the designated thickness. When the dump is filled to the specified thickness, it is allowed to stand idle until decay processes are completed. Decay can be measured by monitoring the gas produced and by measuring the surface height. When the dump becomes fully stable, the parcel of land can be returned to general-purpose use. The time required for the landfill to become stable is extremely variable and depends on the nature of waste, temperature and the amount of water in the soil. It can range from as short as 10 to more than 50 years. When the population was small, there was a modest amount of trash relative to the amount of remote vacant land available for its disposal. In this circumstance, landfill-trash-disposal could be tolerated. With the growth of cities, today there is little unused, unappreciated vacant land. With the current level of waste generation and limited available land, many severe problems have developed. Active landfills are at best smelly undesirable neighbors and at their worst, they threaten health. The layers of trash decay slowly. During this decay period, the land cannot be used for any purpose because methane and other gas seeps to the surface. The gas is a fire hazard and, because it is not pure methane, a toxic hazard. In the near term, anything constructed on the surface will be destroyed by the settling of the waste. The length of time required for the gas and settling to stop is difficult to predict. In warm wet climates, the fill may stabilize in 10 years. In cold dry climates, it can take much longer. Population pressure makes it inconvenient to allow land to lie idle for years. In some locations, the pressure to use the land resulted in the construction of houses before the landfill had become stable. This resulted in much loss of property as houses were cracked and broken by the settling of the ground. The gas and other chemicals that diffused through the ground into the living space of the houses damaged the residents' health. It is increasingly difficult to find suitable locations near the major cities. In the United States, the Love Canal debacle near Buffalo, New York is an example of a dangerous landfill used for homes. A mixture of industrial and domestic waste was dumped into an abandon canal. After only a few years, the land was used to build homes. Toxic waste seeped from the ground and made many of the residents sick. The Government had to buy the homes and spend a large amount of money cleaning up the site. In the United States thousands of highly hazardous landfills and disposal sites have been identified. Similar hazardous sites exist through the world. Before about 1950, landfill effects were ignored. When attention was first directed to the problem 20 or 30 years ago it was thought that in most places landfills caused little damage. Today it is known most landfills have had a dreadfully effect on soil and water quality. Rain percolates down through the decaying layers and carries toxic materials into the water table. This can cause serious ground water pollution when the waste consists of only domestic trash. When industrial trash, with a broad spectrum of materials, is included along with the domestic waste the problem becomes worse. Incineration of waste offers an advantage. Less land is ruined in disposal of the solid ash left after incineration. In some cases, the heat from incineration has been used to generate electricity. Despite advantages over landfills, simple incineration with or without electrical generation has not proven to be a quality method of solid waste disposal. Trash is a poor fuel so it does not produce a hot fire when it burns. The relatively low temperature of a trash fire does a poor job of destroying the material. Because of the low temperature, the flue gas contains many toxic organic substances, such as dioxin. Any sulfur is converted to sulfur dioxide. Chlorine from materials such as polyvinyl chloride is converted to hydrochloric acid. The large volume of combustion products and nitrogen from the air dilutes the toxic substances. The large dilution of the exhaust gas with nitrogen from the air makes removal or recovery of the undesirable contaminants difficult. Unfortunately, the seemingly low concentration of toxic material, that make removal or recovery difficult, is high when considered for release into the environment. The low temperature generated by burning trash with air is far from optimum for the generation of power. The corrosive and toxic materials produced by the combustion process attack the incineration equipment and the boiler reducing their service life. The high level of toxic materials leads to the requirement for costly scrubbers and filters to meet the desired level of output quality. Even though there are many problems associated with incineration, it is useful because the volume of waste is reduced by about 90%. 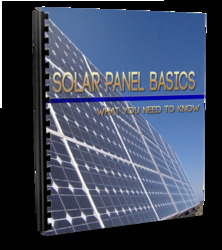 The solids left after incineration contains nothing that can decay, produce gas, or shrink. As a result, a landfill containing only incineration ash produces much less pollution of the air and water. An incinerator ash landfill can be cycled to other uses in a much shorter time than can one holding raw solid waste. With the adoption of the hydrogen energy system, with its excess oxygen, the incineration process can be greatly improved. Oxygen is the significant component of air involved in combustion, but air is only about l/5th oxygen. The remaining 4/5ths is inert nitrogen. The inert nitrogen reduces the combustion reaction rates and dilutes the exhaust gas. For analysis of the differences between incineration with air and oxygen a reference chemical formula for solid waste was generated. Much of the waste is paper and plant refuse composed primarily of cellulose. Plastic, fats and grease, as well as a small amount of protein, were included. Water was included since most waste is damp. Small amounts of chlorine from plastics such as vinyl chloride, and sulfur from protein and rubber were included. Table 8.1 A shows the amounts (in weight percent) of components of the reference waste. Table 8. IB shows the elemental chemical composition of the reference waste derived from the components. The composition shown in Table 8.1 A & B was used with varying amounts of air and oxygen to calculate the mixture ratio necessary to provide the maximum temperature. The results of these calculations are the maximum temperature for the combustion process, the ratio of air or oxygen required to obtain this temperature, and the chemical species present in the equilibrium combustion mixture. Table 8.2 displays the differences between the computed equilibrium reaction of the reference waste with either air or oxygen as the oxidizer. Important advantages are gained by incinerating waste with oxygen rather than air. Pure oxygen fires burn with extreme rapidity. This will allow the design of a relatively small incinerator capable of processing waste at a very high rate. Care must be taken with the design of the incinerator to ensure the rapid reaction can be controlled and the waste processing conducted without damage to the equipment. In oxygen incineration, the rapid reaction and high temperatures will destroy all organic compounds and convert them to water and carbon dioxide. It will be essentially impossible for a toxic organic compound such as dioxin to pass through oxygen-enhanced incineration. Only toxic elements such as sulfur and chlorine escape destruction. Despite the fact that toxic elements pass through the incinerator, the use of oxygen still confers an advantage. Oxygen helps in protecting the environment from toxic elements because the output gases from the combustion process contain only reaction products, undiluted with nitrogen from the air. Table 8-2 shows the major constituents of the gas are carbon dioxide and water vapor. When this mixture is cooled to below 100 degrees Celsius, the water and the water soluble impurities will condense as a liquid. This will allow the capture and recovery of the sulfuric and hydrochloric acid produced by the combustion of waste containing sulfur and chlorine. Ultimately, the only product vented to the atmosphere is the carbon dioxide. 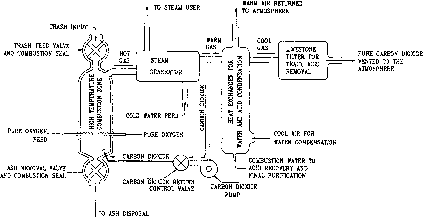 While not yet developed Figure 8.1 shows the authors conception of an oxygen-enhanced incinerator. There are subtle reasons why venting carbon dioxide from trash incineration is of far less concern than the venting of the same gas from fossil fuel combustion reactions. Large portions of the carbon compounds in domestic trash are paper and food wastes. Only a few years ago the carbon contained in these plant products was part of the atmosphere. On a long-term basis, returning this carbon to the atmosphere has no effect on the overall carbon dioxide balance; it simply speeds up the rate of recycle of carbon from plant material to the biosphere. The high temperature gas resulting from the oxygen-enhanced combustion of trash is more useful for the generation of electricity than is the relatively cooler gas generated from incineration of trash with air. As a result, the generation of useful energy in conjunction with the elimination of the waste by high intensity oxygen combustion is quite practical. The solid ash remaining from oxygen-enhanced incineration will only consist of minerals. All the carbon containing materials will have been removed. Without organic carbon, the ash will not support decay organisms. Since there is no decay, there will be no gas produced and little settling. The ash will weigh only a fraction (2% to 10%) of the weight of the original trash. It will occupy a much smaller volume. When buried in a landfill and physically compacted, structures can be built on the land within a time as short as two years. Adoption of the Fusion-Hydrogen energy cycle will provide the means, oxygen fired incineration, for near elimination of the long-term problems associated with the disposal of trash. In addition, oxygen can be used to great advantage in the treatment of contaminated water.